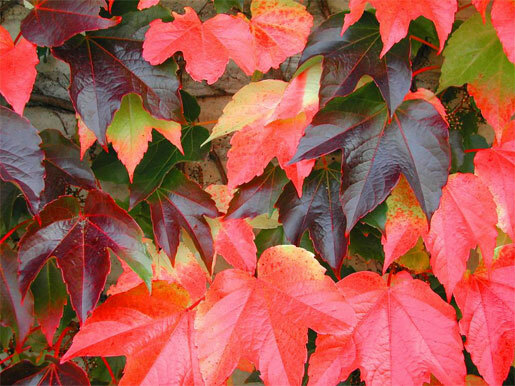 Boston Ivy is a vigorous hardy climber originally from East Asia. The plant is classically used to cover buildings and the striking foliage along with magnificent autumn colours provide an incredible visual effect. A not so well known characteristic of the plant is that the sap can be tapped in the spring and used as a sugar substitute. The mature plants make good habitat for insects and the plant is known to be a host of the Elephant Hawk-moth. To order this plant please contact us. balkanecologyproject@gmail.com. soil pH: Suitable pH: acid, neutral and basic (alkaline) soils. Needs a support structure upon which to grow unless grown as a ground cover. Plants are very tolerant of trimming and can be cut right back to within 1m of the base and will grow back well. Deciduous Climber growing to 18 m at a fast rate. It is in flower from July to August, and the seeds ripen from Oct to November. The plant can be used to cover the walls of buildings and fences. Can create a windbreak if grown up a trellis. Can be grown as a ground cover plant in a sunny position. Plants should be spaced about 2.5 metres apart each way. A rampant climbing plant, clinging by means of round pad-like suckers on the tendrils. The flowers are only produced on mature stems and plants usually only fruit after a long hot summer. Boston Ivy is excellent in preventing soil erosion.